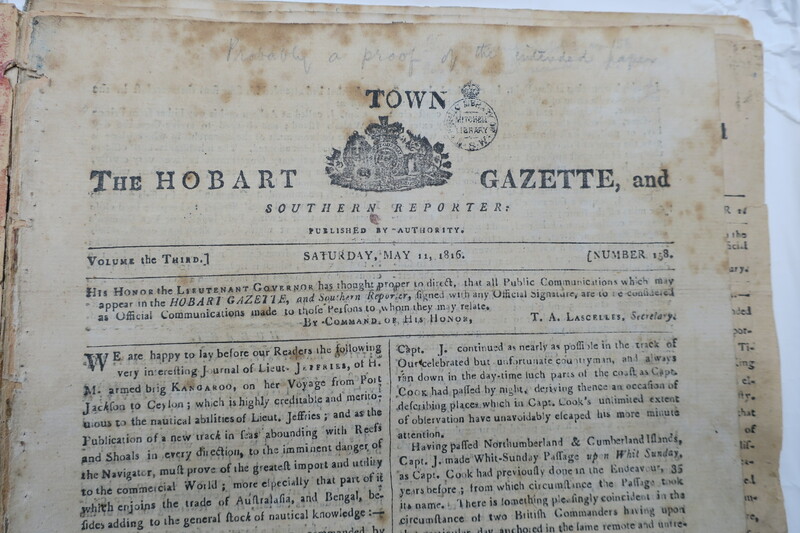 The Hobart Town Gazette, and Southern Reporter. Hobart Town: Printed by Andrew Bent. Weekly (Saturday). Published by authority. A two volume facsimile print reproduction of issues for 1816-1819 was published Hobart: Platypus Publications, 1965. The first official issue was 1 June 1816, and there are several statements by Bent himself to confirm that. He always maintained that although the newspaper was the vehicle for official communications it was his property, and was established at his own initiative and expense. Unlike his predecessor as Government Printer, George Clarke, who printed the Van Diemen’s Land Gazette in 1814, Bent’s name never appeared in the imprint as Government Printer, although he held that position and was obviously permitted to use the government press to produce his newspaper. The issues for 6 Jan. and 13 Jan. 1821 used a different coat of arms and then on 20 Jan. the masthead was further redesigned and the title changed. The Hobart Town Gazette, and Van Diemen’s Land Advertiser. Hobart Town: Printed by A. Bent. v. 6, no. 245 (20 Jan. 1821)-v. 10, no. 484 (12 Aug. 1825). Weekly (Saturday 1821-3; Friday 1824-5). Published by authority (until 17 June 1825). During 1821 another paper shortage meant some issues were printed on blue paper. In 1824 (Bent now having a larger press and ample type) the number of pages increased to four, they were bigger, and could contain much more matter. He now encouraged correspondence from readers, an offer which was eagerly taken up. Publication day changed to Friday with issue for 2 Jan. 1824. Price £2 12s. per annum, in town, and £2 15s. if sent by post. 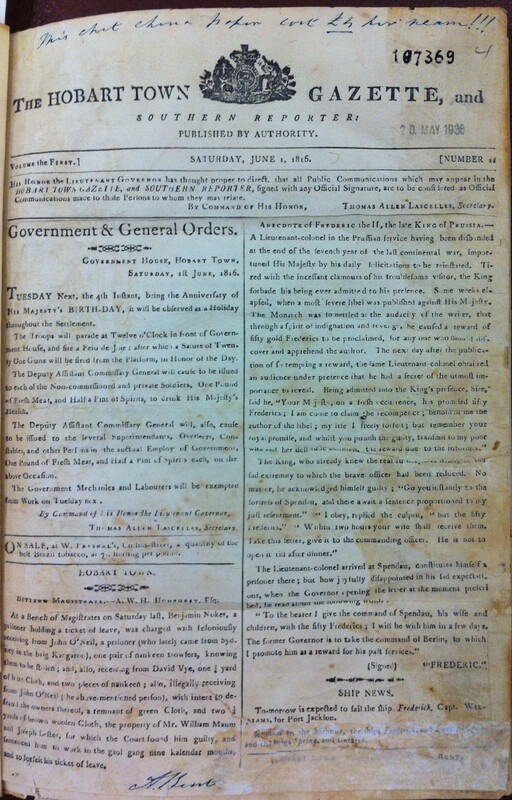 The issue for 4 June 1824 was in physical appearance no different from the previous issues but it was the first Australian newspaper to be printed free of Government censorship. Around this time (very shortly after the arrival of Governor Arthur) Bent had cemented his complete ownership of the printing equipment and sacked the editor who had been appointed by Governor Sorell about six months previously, claiming the right to choose his own. On 4 June Bent did not take the proofs to Government House for inspection, as had been his usual practice, but corrected them himself before printing off the final copies. In October Bent’s position was upheld by Governor in Chief Brisbane and from this point his newspaper, now edited by Evan Henry Thomas and with its tone largely determined by a group of disaffected free settlers led by Robert Lathrop Murray and Anthony Fenn Kemp, became increasingly critical of Arthur’s administration. The issue for 8 Oct. contained a triumphant report of Brisbane’s decision which later saw Bent prosecuted for libel, and from this day the imprint read: TASMANIA. Printed and Published by ANDREW BENT, the Original and Sole Proprietor. In Jan. 1825 the pages increased slightly in size and a completely new masthead represented the paper’s aggressive anti government stance. Bent’s statement of sole and original proprietorship was brought to the front and faced off against Arthur’s direction about government notices. The words ‘published by authority’ were much reduced in size and appeared below a title and subtitle powerfully represented in Bent’s new and very large black lettering. By June 1825 Arthur had made alternative arrangements. Bent was dismissed from his position as Government Printer and replaced by James Ross and George Terry Howe. From 25 June 1825 they printed the official gazette, and for legal reasons used the same short title. They also continued the numbering of Bent’s paper. Bent claimed his title had been pirated and continued to print as usual so two rival gazettes appeared each week until on 19 August Bent capitulated and changed the title of his newspaper to the Colonial Times. When the rival HTG appeared Thomas resigned, and Murray took over as Bent’s editor. Copies: Signficant holdings of Bent’s HTG are in ANL, Crowther, DC, ML, TAHO and VSL (from Thomas Scott’s Earlston collection) but none has an absolutely complete set. The ML set has the only known copy of 11 May 1816. Colonial Office set in TNA CO283/1 is complete except for the May 11 issue, but a number of issues for 1816 and the early part of 1817 are handwritten copies written out by Thomas Wells, which led Bonwick to assert, quite wrongly, that these issues were originally published only in manuscript. Significant holdings also in Wilson Collection. In 1849 Bent sold a set of bound volumes of the HTG and CT (his own file copies) to the Tasmanian government. Most survive, although they have become scattered, with some volumes disappearing probably in the 1920s. Bent’s HTG volumes for 1816-18 are in ANL; 1824 in ML; 1819, 1821-23 and 1825 remain in TAHO; 1820 is missing. Some are annotated by Bent himself and by others (including J. E. Calder). The issue for 1 June 1816 in NLA is autographed by Bent and bears a note complaining about how much he had to pay for the china paper on which it was printed. The digitised issues on Trove are a mixture from various repositories. All the issues for 1823, and issues for July-Aug. 1825 would appear to be Bent’s own copies.